Supervisor 1 Dr. V. K. Gupta - Materia Medica 2 Dr. C. B. Nayak - Materia Medica 3 Dr. Farokh J Master - Materia Medica 4 Dr. Tarkekshwar Jain - Materia Medica 5 Dr. Ramjee Singh - Repertory 6 Dr. S. K. Tiwari - Repertory 7 Dr. Niranjan Mohanti - Repertory 8 Dr. J. D. Daryani - Repertory 9 Dr. S. M. Singh - Organon of Medicine 10 Dr. Dilip Dadhich - Organon of Medicine 11 Dr. V. K. Khanna - Organon of Medicine Each supervisor shall be alloted 2 candidates. * If a candidate downloads the form, he/she must attach a D.D. of Rs. 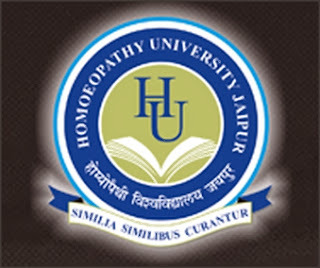 3000/- in favour of Homoeopathy University, jaipur, payble at Jaipur. * If a candidate downloads the form, he/she must send two self addressed envelop as D1 for Admit Card & D2 for marksheet & Counseling letter. (Size 5”X11”).